More comfort options for your passenger! HD-125A: For ’93 and newer FLTs, FLHTs, FLTRs, FLHS’, FLHXs, FLHRs & FLHTG. Adjusts to 12 positions through a rotating 9” range of motion in seconds by pulling the spring-loaded locking pins. Gives your passenger(s) the best possible leg support and comfort. 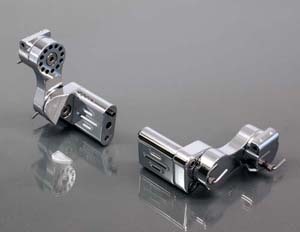 The mounts are CNC machined from billet aluminum and all parts are triple chrome plated. Installs easily without modification to the bike. 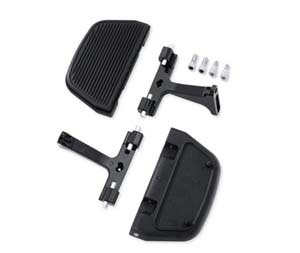 Includes Classic Steel Passenger Floorboards with anti-vibration rubber pads to ensure greater passenger comfort. 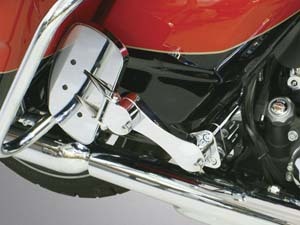 HD-125A-RE: Same as above for bikes w/Rinehart Exhaust. 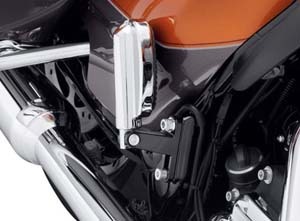 HD-005A: Adjusts in seconds by pulling the spring loaded locking pins. 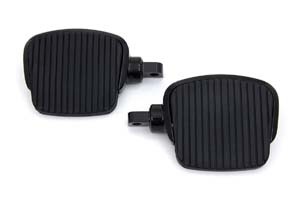 The ultimate in passenger comfort, they greatly increase foot and leg support over the stock boards. 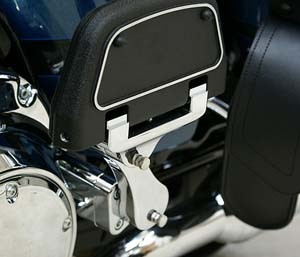 The pads are made of anti-vibration neoprene to ensure passenger comfort. 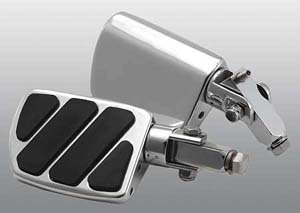 The boards and mounts are CNC machined from billet aluminum and triple chrome-plated. 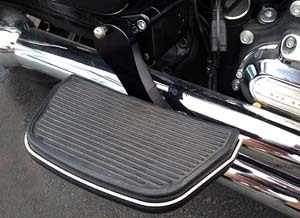 We have also moved the boards 2.5" forward to eliminate the commonly reported problem from passengers of their calves pressing against the saddlebag guard rail, causing discomfort. Installs easily without modification to the bike. For 1993 and newer FLTs, FLHs, FLTRs, including the 2009 models. HD-005A-RE: Same as above for bikes w/Rinehart Exhaust. HDP-BLA: Adjusts to 12 positions through a rotating 9" range of motion, moving the boards 4" forward. 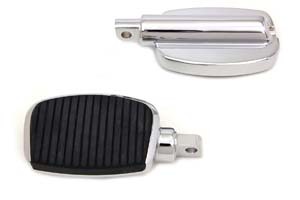 These triple chrome plated mounts adjust to 12 positions through a rotating 9" range of motion, utilizing locking pins to move the boards 4" forward, similar to what is used in all of our other Adjustable Passenger Floorboard sets but they do not include the floorboards. 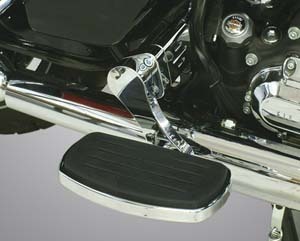 They are CNC machined from billet aluminum to accept the stock or any Harley-Davidson® accessory floorboards. HDP-BLAB: Adjusts to 12 positions through a rotating 9" range of motion, moving the boards 4" forward. 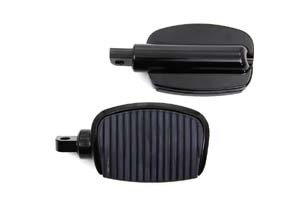 These hard coated black anodized mounts adjust to 12 positions through a rotating 9" range of motion, utilizing locking pins to move the boards 4" forward, similar to what is used in all of our other Adjustable Passenger Floorboard sets but they do not include the floorboards. 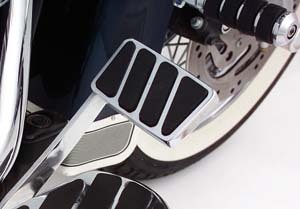 They are CNC machined from billet aluminum to accept the stock or any Harley-Davidson® accessory floorboards. HDP-BLA-RE: Same as above for bikes w/Rinehart Exhaust. 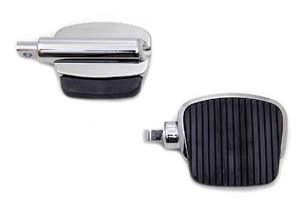 HD-024: The stock boards on your bike do the job, keeping your feet from dragging on the ground, but have you ever noticed that they look more like the gas pedal on a dump truck rather than something that belongs on your bike? Our Driver Boards, on the other hand, are 20% larger in surface area than the stock boards and will give you more room to move your feet around and reduce fatigue on long trips. The soft neoprene rubber inlays greatly reduce vibration. Their shape and angle will give your bike that highly-customized look. 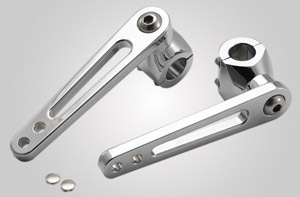 They are CNC machined from solid billets of aircraft aluminum, triple chrome plated, and come with all required hardware. 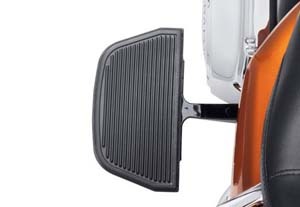 They also have a replaceable drag-warning indicator on the bottom leading edge to prevent scraping the boards during hard cornering. 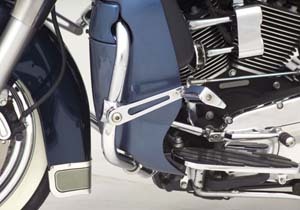 HD-005: Engine Guard Mounts for Harley Davidsons. CNC Machined Billet Aluminum, compatible with or without lowers. These all-aluminum highway mounts are CNC machined from aircraft-quality billet aluminum. 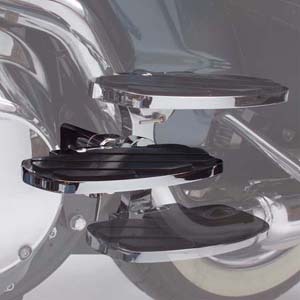 This structural design makes the mounts strong enough that you can stand on the mounts and they will not slip! 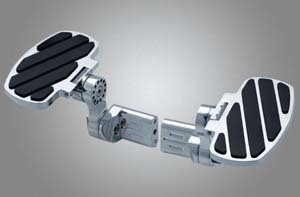 The 6" long arms have a full 360° range of motion to accommodate any leg length. This means 56 possible adjustments! The arms lock into the selected position with an internal locking pin. 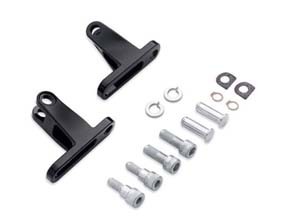 The mounts can be used with below pegs or any other peg having up to a 3/8" mounting bolt. 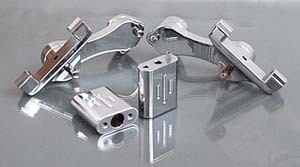 The set is triple chrome plated, comes with all stainless steel hardware, and detailed mounting instructions. Pegs sold separately. PEGSW: Machined from billet aluminum, triple chrome plated. Flat on top to match the bottom of your shoe, adding maximum comfort and support with a custom look. 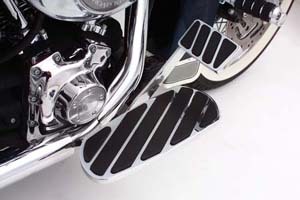 Soft neoprene rubber inlays absorb vibration to reduce fatigue in your legs. Also has an adjusting setscrew to keep the pegs at your desired position. Comes with 3/8" bolts and can be used with above highway mounts.